In Moscow you get the chance to go skating at the very foot of the Kremlin walls. The city’s central ice rink is on Red Square and adjacent to GUM – a site that has enjoyed popularity for a number of years. This year it has been open since the earliest onset of winter. The rink can accommodate up to 450 skaters at once, with tickets going for 250 rubles ($8) on weekdays, and up to 500 rubles over weekends and public holidays. 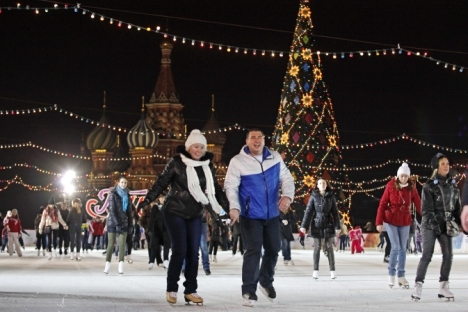 Moscow’s best-known skating rink is the one at Gorky Park, which opened this year on Dec 1. Skating at Gorky Park is a tradition dating back to before World War II. The rink gained an extra popularity boost when Gorky Park underwent a full-scale makeover last year – the Moscow administration made the park cleaner, more convenient, and more like parks in other major cities. In short, it is now less like the LunaPark era of the gold-rush 1990s. Skaters will find 18,000 square meters (193,750 square feet) of ice here, laid out in the avenues, boardwalks, and the fountain square. Here, ice-hockey fans will find a laid-out hockey pitch that can be rented by those ready for a face-off. To make the park’s facilities more accessible for skaters, all of its many cafes can be visited without guests having to take off their skates. The rink opens daily except Mondays, from 10 a.m. to 11 p.m., with a technical break from 3 p.m. to 5 p.m. A ticket to skate costs 200 rubles on weekdays, rising to 300 rubles over weekends and public holidays. Kids can go for 100 rubles at all times. Guests can borrow skates free of charge and without any time limit, although 1,500 rubles need to be put down as the deposit per pair. The park administration was compelled to introduce the deposit system last year, when around 700 pairs of free-loan skates disappeared in the first five days of the season. Many skaters simply did not bother to return their skates afterward. However, once the deposit system was introduced, a sudden upsurge in immaculately returned skates occurred, with people keen to secure their deposit back in full. Another rink well worth trying is located in Sokolniki Park. There are actually two rinks here of 5,400 and 17,000 square meters each. The smaller one, called “Ice,” is laid out on the park’s Festival Square – a project set up by the design bureau Wowhouse, which is already well-known for its installations at Gorky Park. Skating in this rink is more like taking part in some kind of show. The park management has already arranged to bring in light and video installations from France. A two-hour skate here costs from 100-400 rubles, depending on the time and day of the visit. The second rink at Sokolniki is hugely larger than “Ice,” with 17,000 square meters of skating space under the name “Big Rink.” It is laid out as a huge circular skating space in the middle of the park, with radial alleys leading off it. Skate rental costs 200 rubles per 2.5-hour session, but those with their own skates go in for free. The rinks at Sokolniki opened on Dec. 15 this season. Moscow’s biggest rink of all opens in mid-December, near to Botanichesky Sad metro station in the north of the city. The “Iskra” rink offers 20,000 square meters of ice, arranged in two stadiums over one field covered in high-quality ice. Visitors can rent skates or bring their own.